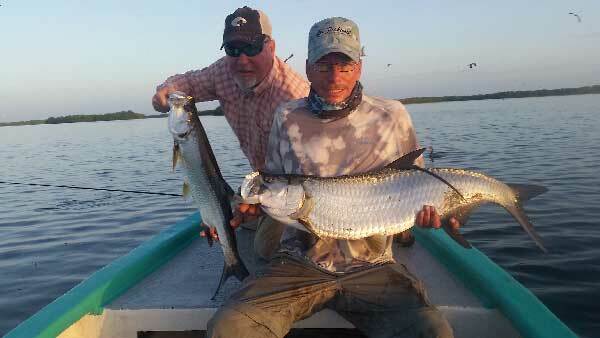 Come join us for an amazing week of baby tarpon fishing on Mexico’s Yucatan Peninsula. With easy travel to and transfer from Cancun, Mexico, the Tarpon Cay Lodge is an excellent escape to some of the best baby tarpon fishing in the world! Experience the fishing, the culture, and the food with your favorite fly shop. This wonderful destination is located in a charming little fishing town on the northern coast of the Yucatan. Tarpon Cay Lodge is truly the complete Tarpon experience. It offers world-class angling for baby Tarpon – 5 to 30+ lbs!!! Its unique year-round fishery offers the fly angler a variety of environs in which to pursue these wily sportfish. 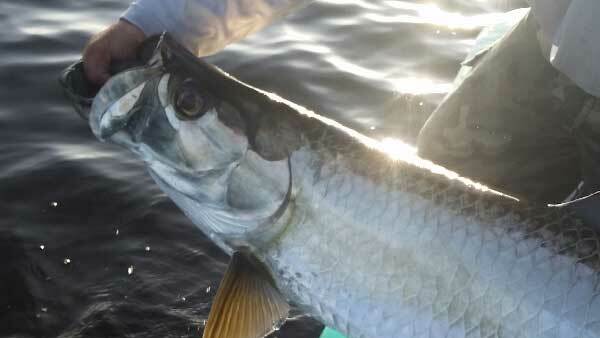 In addition, during the summer months pursuits for migratory adult Tarpon (40 to 100+ lbs.) are a possibility too. The full service lodge provides comfortable accommodations, hearty meals with a local flavor, and an excellent staff that truly makes you feel like family. From majestic tropical sunsets to incredible jumping Tarpon, your visit to Tarpon Cay Lodge will etch memories of a lifetime. The accommodations at Tarpon Cay Lodge are comfortable, bright, and enriched with traditional Mexican decor. With the ocean at its doorstep, the sea breeze and beautiful scenery refreshes the spirit after a long day of fighting Tarpon. A spacious lounge provides dining areas, comfortable seating for relaxing, and a nice workspace for fly tying or working on tackle at the day’s end. As we venture upstairs, you will find spacious guest rooms equipped with air-conditioning, fans, and a full private bath with shower. Rooms are bright with a nice ocean view. There is a housekeeping service that cleans the room and replaces linens, towels, bottled drinking water, cups, and bar soap each day. A unique feature of the lodge is a nice rooftop balcony. It provides a splendid 360 degree view of the charming area surrounding the lodge – perfect for after-dinner relaxation. In addition to world-class fishing, the hallmark of Tarpon Cay Lodge is their warm hospitality and top-level service. The staff members at Tarpon Cay Lodge are some of the most friendly and hardworking people you will ever meet. They are sincerely committed to making your stay comfortable and enjoyable. The wonderful meals are yet another highlight of your stay at Tarpon Cay Lodge. Hearty portions with a local flavor are an absolute culinary delight for the big appetite. Breakfast is ordered the night prior from a full menu (American and Mexican dishes). Your breakfast will be promptly served in the morning to assure you an on-time start of your daily fishing adventure. Lunches consist of made-to-order sandwiches, snacks, and assorted beverages. Upon your return from an exciting day of Tarpon-mania, dinner is served. Entrees may include chicken, pork, or the catch-of-the-day – fish, shrimp, or even lobster! The meals at Tarpon Cay Lodge are truly unique and delicious. Additionally, the lodge can accommodate most dietary restrictions. Let the staff know and they will prepare an appetizing alternative that is often looked over with envy by your fellow dinner guests. All drinking water and ice is bottled/made from purified water. All non-alcoholic beverages (soda, juice, water) are included in your lodge package. Alcoholic beverages are available, but not included (charged to the guest tab). 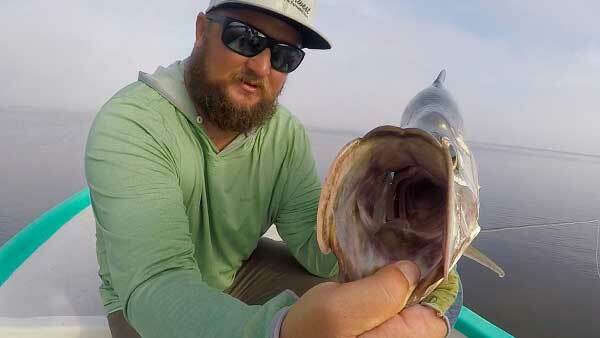 Tarpon Cay Lodge is truly the new frontier in world-class angling for “baby” Tarpon. Ranging in size from 5 to 35 pounds, these Tarpon reside in environs of turtle grass flats and mangrove lined lagoons, creeks, and bays. This habitat is also home to Snook and Barracuda. Most significantly, this incredible fishery has been designated a marine preserve, thus protecting this Tarpon “nursery” from commercial netting and fishing. The hallmark of the fishery at Tarpon Cay Lodge is the sheer numbers of baby Tarpon that inhabit the region. On a calm day, it is not uncommon to observe pods of Tarpon rolling and slashing bait on the flats – an awe-inspiring moment to say the least … don’t forget to cast. Another highlight is during the months of June thru August, migratory Tarpon (40 to 100+ pounds) inhabit the waters near Tarpon Cay Lodge. If weather conditions allow (low wind), anglers can pursue these “Silver Kings.” Whether you are sight-casting to rolling Tarpon on the flats or working the mangroves with your top-water pattern, fly fishing for Tarpon is a pure adrenaline rush. Tarpon Cay Lodge utilizes spacious 18 foot pangas with an extensive level casting deck. All fishing is conducted out of these stealthy, stable, and comfortable fishing platforms. The nearest boundary of the fishery is very close to the lodge and, therefore, only requires a 15 – 25 minute boat ride to arrive at most of your fishing areas.Most anglers prefer to fish 7 to 9 weight rods at Tarpon Cay. When weather conditions and/or size of fish dictate, 8 to 9 weight rods are the order of the day. 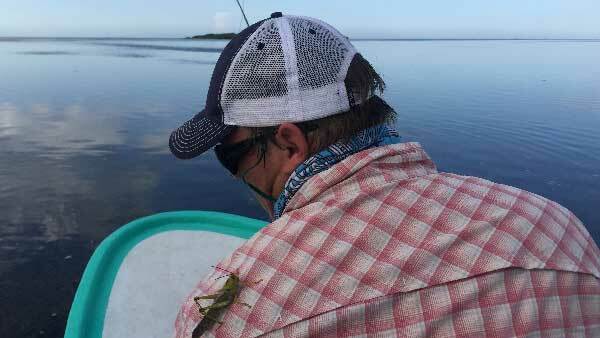 The wonderful part of fly fishing at Tarpon Cay Lodge is that most of the fishing is done with floating lines. 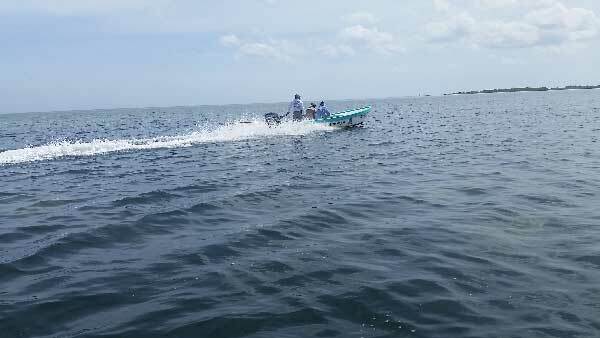 The Tarpon hold or cruise in areas as shallow as one foot deep! This shallow water pursuit demands lightweight (slow sinking) Tarpon flies or top-water offerings such as floating Puglisis, sliders, or crease flies. When conditions are prime, this shallow water angling makes for an exciting visual display – Tarpon waking behind your fly and a top-water “blow-up” finale … it does not get any better than this! When pursuing migratory Tarpon (40# – 100#), a 10+ weight rod is essential to battle these silver brutes. Deposits, less a $300.00 USD cancellation fee per person, will be refunded if the client cancels the trip in writing more than 180 days prior to the original trip date. If written cancellation notice is received between 90 to 180 days prior to arrival, no refunds will be issued but the deposit amount, less a $300.00 USD rebooking fee per person, may be applied to a future booking within one year of original trip date. For written cancellation notices received less than 90 days prior to arrival, all payments are forfeited unless the client has an immediate replacement at the time of cancellation. A 50% deposit is due within 14 days of booking to secure reservation. Final payment is due 60 days prior to scheduled arrival date. Refunds: A $150.00 USD processing fee per person (in addition to any lodge cancellation fees) may be deducted from all refunds. All refunds will be paid by check. If written cancellation notice is received less than 180 days prior to the trip arrival date, no refunds will be issued. Fishwest and Yucatan Fly Fishing Adventures acts only as agents for contractors or owners and outfitters, airlines, charter air, and ground transportation carriers or other services. 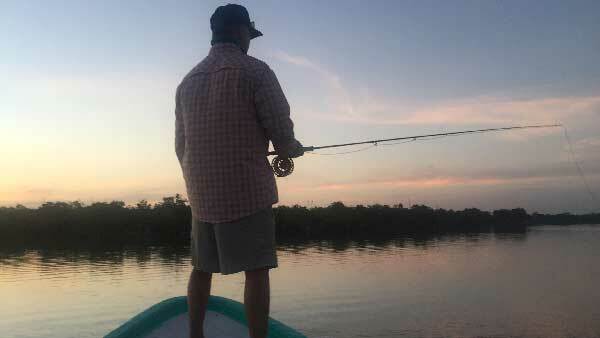 Payment of funds for fishing and other Fishwest and Yucatan Fly Fishing Adventures trips shall be deemed acceptance and consent of the following conditions. Fishwest and Yucatan Fly Fishing Adventures or any of its affiliates or associated companies shall not be held liable for any loss or damages howsoever caused or arising from services provided by hotels or lodges, outfitters, guides, means of transportation or other services. Baggage and personal effects are the sole responsibility of the traveling client at all times. In the event a cancellation is necessary all deposits will be nonrefundable unless a suitable replacement is found. Trip cancellation insurance is recommended.